DREAMERS, MAKERS, THINKERS, EXPLORERS, INNOVATORS, CREATORS & STAR-GAZERS EXPERIENCED A WEEKEND OF FUN AND DISCOVERY! Thank you for attending the 5th USA Science & Engineering Festival Expo this past April 7-8, 2018! Attendees explored 3,000 hands-on exhibits from the world’s leading scientific and engineering societies, universities, government agencies, high-tech corporations and STEM organizations. The two-day Expo was perfect for children, teens, and families who want to inspire their curious minds. Over 350K+ attendees celebrated science at the Expo and engaged in activities with some of the biggest names in STEM. They heard stories of inspiration and courage, participated in mind-boggling experiments and rocked out to science during our incredible stage shows. 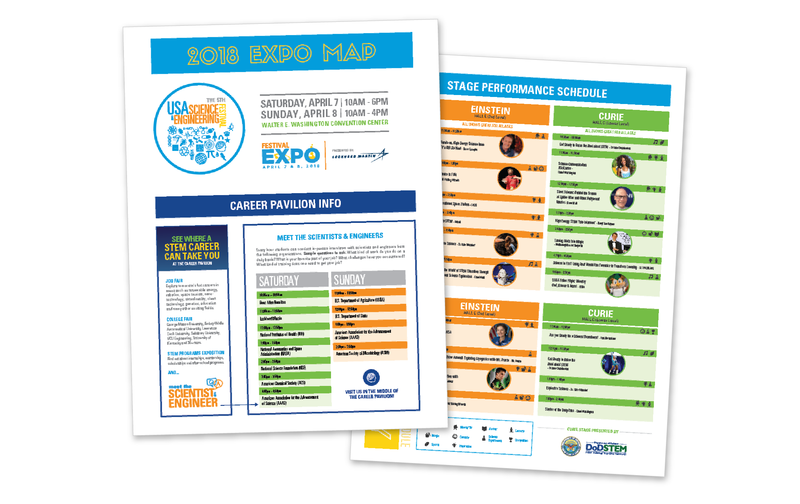 Download a printable version of the 2018 Expo Map. Includes expo floorplans with pavilion and booth info, stage show schedules and “Meet the Scientist & Engineer” schedules! Enter the FIRE LAB: Forensic Science for Young Xplorers with UL- XPLORLABS. Learn about space travel and the possibility of human life on Mars with Space X. Check out 20+ far out exhibits – explore the Moon with NASA’s Lunar Reconnaissance Orbiter, journey to Mars, and discover what the day in the life of a NASA Astronaut is really like. Enter carnival style interactive trailers and discover the latest research at the Oak Ridge National Laboratory. Live hands-on neuroscience with Backyard Brains! Explore the relationship between art, design, and technology with Deloitte. The science of sleep with ResMed. Test out your coding skills with Schlumberger. Check out the animal rescue boat and learn about manatee rescues with SeaWorld! Discover the life of a scientist – from getting up close and personal with live frogs and salamanders, to getting a behind-the-scenes look into how cocoa beans become chocolate bars, or even discovering what breed your rescue dog is with MARS. See if you and your friends can solve our STEM challenges to crack the code to our escape room, and then check out our artificial intelligence demo featuring Alan the mini bot with EY. MEET ASIMO – Honda’s advanced humanoid robot. Watch him run, climb stairs and act human-like. Explore robots of all kinds at “Robofest” within the Makerspace Pavilion. For a full exhibitor listing click here.